Big news: QW is now employee owned! I realize that many of you know this, but I’ll bet few know the background or details that I get into in the Rambling, “Be Careful What You Dream,” that is linked to this letter. This is really cool stuff! We are amazingly psyched! Please read on to get up to speed on some other fun stuff that we are doing. My bet is that you’ll be especially interested in the article about some new amenities at Proximity Hotel. We are honored that you choose to visit our places and that you opt to hear from us. If you don’t want to get these letters, please email us at qwrhinfo@qwrh.com. Conversely, if you wish to receive more frequent news, please sign up on any of our websites (all listed at the end of this page), Facebook, Instagram or Pinterest. We love feedback. If the spirit moves you, please share the good stuff on websites like tripadvisor.com. If we goofed something up, we want to know about it right away. Please email us at feedback@qwrh.com or call the various numbers at the tail end of this letter. Just an aside: Using the pronoun “we” seems most appropriate because, though I (Dennis) write these letters, many people contribute to them. As much as it is our ethos always to keep our hotels and restaurants updated, with Proximity Hotel nearing her tenth birthday, we decided to “go deep” and figure out what we could do to cause our guests to feel even more comfortable and in harmony with this wonderful hotel: pH Balance, get it? (Often, the names of our projects give us a giggle…while others may groan!) With every effort such as this, we not only name the process/project, but we also agree on an “intention,” then endeavor to stay true to it. It seems that life is more full and rich when lived with overtones of sincere purpose and undertones of mirth and levity. We undertook this process/project with all of these ideas right at the center of our field of vision. Whew…and that’s just the guest rooms! We’ve also improved the guest “living rooms” (the gathering places just for our guests on each floor) and the corridors with that amazing Chilewich wall covering I mentioned, along with a wainscot rail cap, improved lighting that uses even less juice and yet another custom-designed carpet. 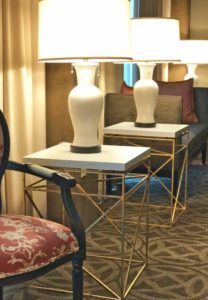 Jeff Kennedy and his QWCG colleagues built 36 amazing side tables with gold leaf frames and enameled concrete tops. Each table holds a lamp commissioned by the Design Team. These suites now have exceptional leather sofas and chairs that we designed in collaboration with our friends at (and I’m not making this up) O.Henry House, Ltd. BTW: The leather is from another local outfit, Tiger Leather. We did a lot more than this in the suites, but the powers that be say I’m over my word count. We’ve also added some comfy leather sofas and chairs to the lobby; plus, early in the process, QWCG—with our friend J. Speetjens doing the woodwork—built the high tables that are in the social lobby. All sorts of craft-made things from right here in our community! 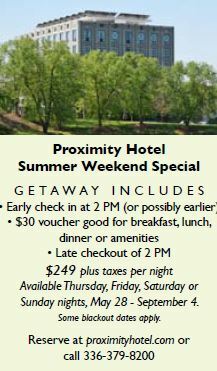 You can see most of these enhancements on our website or in person…but please call Proximity Hotel at (336) 379-8200 or email proxinfo@proximityhotel.com ahead so we can be sure that we have rooms to show. As I’ll bet you can tell by his comments, Chip is a joy to work with…and what a talent! If you know someone who might enjoy playing restaurant and/or hotel with us, please send them our way! We’re looking for even more enthusiastic, friendly and competent folk to play roles ranging from restaurant service staff members and hotel guest service representatives to leadership team members. Current opportunities are listed at qwrh.com/current-openings. And please tell people you might refer to us that they also can apply for a role that isn’t currently listed. Each Tuesday from 6 PM ‘til 9 PM the bar at our Lucky 32 Southern Kitchen in Greensboro has great live music, plus some special snacks and libations…no cover charge! Visit lucky32.com for the lineup. You’ll be impressed. Wednesday evenings at Print Works Bistro have become quite a sensation. It’s partly because of some “specials,” but mostly because of the extraordinary live music. Our Chef’s Mussels are just $15 and we have five wines from $10 to $15 a bottle. The kicker: Evan Olson and Jessica Mashburn of AM rOdeO perform fantastic covers and original music from 7–10 PM. No cover charge! Jazz: It turns out that the lobby at the O.Henry Hotel is a great venue for jazz, cocktails and tapas-style good eats. That’s what you’ll find at our Cocktails & Jazz Series each Thursday. Artists Dave Fox (piano), Neill Clegg (saxophone, clarinet and flute) and newly added Matt Kendrick (on double bass) are joined each week by a rotating group of extraordinary guest vocalists who cover The Great American Songbook and other jazz classics, along with a surprise ditty every now and then (from 5:30-8:30 PM). For O.Henry Jazz Series on select Saturdays, we host an eclectic array of local artists performing a variety of jazz genres (from 6:30-9:30 PM). Want to make a night of it? 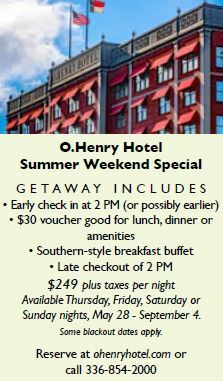 Book our overnight Jazz Package online and see the schedule at ohenryhotel.com/o-henry-jazz. Skillet-Fried Chicken: Starting at 3 PM every Sunday at Lucky’s in Greensboro and Cary, just after we stop serving our brunch menu, we dish up this extra-special fried chicken! Cary just added this good stuff to their Sunday evening offerings, in addition to serving it every Wednesday from 4 PM. It’s pan-fried in locally rendered lard and served with mashed potatoes, giblet gravy, collard greens and a hunk of dipping cornbread. You can also get it packed up to take home or for a summer picnic. This is the real deal! Taking tea in the Social Lobby of O.Henry Hotel is an extraordinary experience. The service, ambience, tea, scones, finger sandwiches and treats are phenom! Friday, Saturday and Sunday, 12 Noon-5 PM, Monday–Wednesday, 2-5 PM and Thursday, 2-3:30 PM (to accommodate setup for Thursday Night Cocktails & Jazz). For reservations, please call Green Valley Grill at (336) 854-2015. Updates to Our Hotel Loyalty Program: New Benefits! 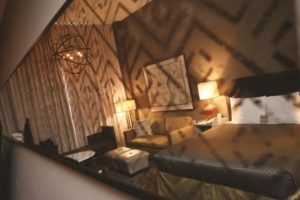 Our Quaintance-Weaver Loyalty Program at O.Henry and Proximity Hotels is designed to reward individuals or companies that use 40 or more rooms a year. There are 17 special benefits, including discounted rates, a dining voucher for each overnight stay, exclusive seasonal specials and, well, 14 other benefits (learn more at ohenryhotel.com/qwlp and proximityhotel.com/qwlp). Please call our program coordinator at 336-478-9158, or email us at qwlp@qwrh.com for program details or to enroll now. Elaborate Shindigs or Simple Meetings…and Everything In Between! One of the great joys of having a career in this business is that we get to help design and pull off events where enduring memories are made. Fancy dinner parties or cocktail soirées are a blast for us to plan and execute and, being the hotel/restaurant junkies that we are, we also get a charge out of helping make even routine meetings or business lunches special. The enthusiastic and professional people on our event planning team share this passion. Please call or email if you are considering any sort of event. I think you’ll be pleased you did! Trivia: We have space to handle up to 400 people for events (Who knew?!). O.Henry and Proximity Hotels offer bespoke events ranging from weddings, receptions, luncheons and swanky dinners to office parties and retreats. Call our event planning team at (336) 478-9111, email events@qwrh.com or visit ohenryhotel.com and proximityhotel.com. Lucky’s in Cary can handle up to 70 people in a semi-private dining area. Call (919) 233-1632 or email crescentgreen@qwrh.com. Lucky’s in Greensboro has the private Starlight room that seats 10, but of course we can host larger groups in our dining room. Call (336) 370-0707 or email westover@qwrh.com. 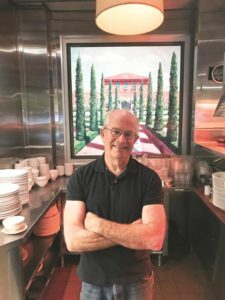 In Print Works Bistro’s and Green Valley Grill’s dining rooms, there are nooks and crannies that can accommodate larger numbers of people than one might realize. 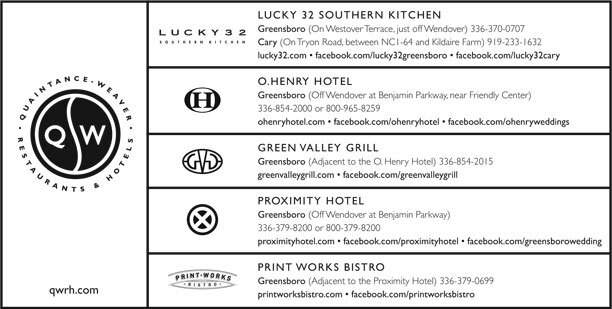 Call Print Works Bistro at (336) 379-0699 or email printworksbistro@qwrh.com, or Green Valley Grill at (336) 854-2015 or email gvgrill@qwrh.com. Oh…and if you have an event coming up and need a place for your out-of-town guests, please call our planning team at (336) 478-9111 or email us events@qwrh.com. Brand new—hot off the press! 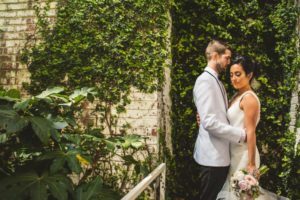 Our comprehensive summer wedding package includes all the luxe details of an O.Henry or Proximity wedding in a value-priced package that’s turn-key and easy to plan on short notice! Let us do the work for you so you can enjoy the day…worry free. 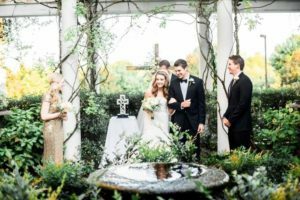 To plan your summer wedding, please call us at (336) 478-9111 or email us at weddings@qwrh.com. Visit ohenryhotel.com/weddings and proximityhotel.com/weddings for the details. Limited time offer! A few of us keep our eyes out for neat stuff that’s happening at our places, then post them on Facebook, Instagram and Pinterest. We post updates on the latest lunch, dinner and brunch featured menu selections, news and the good stuff that we find at local farms. Of note right now: You might want to take a trip to Green Valley Grill to see our NEW Veggie Bike, the mother of all bikes! It’s sure to help keep our chef’s muscles in shape.